Great content, like great ideas, can spring from anywhere. One great place to start is researching your competitor's content. Understanding what’s working well for the leaders in your space is the first step in improving your content intelligence. It's not enough to know your competitor just published a great new whitepaper. You need to step back and assess their entire body of work to generate meaningful insights that will inform your own work. The companies you compete with for readers, engagements, and links may not be the same as those you compete with for sales. To make sure you are benchmarking against the right competitors, we recommend starting your analysis by looking at topics, not domains. 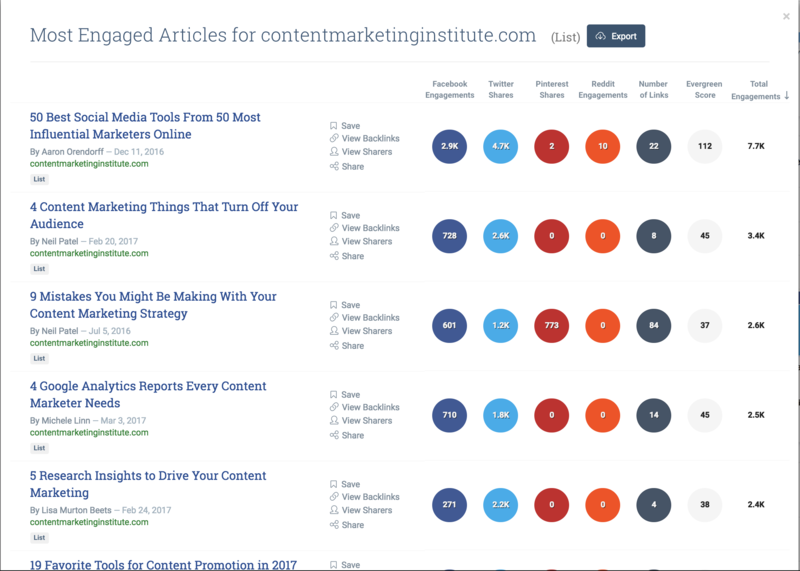 In BuzzSumo's Content Analysis, enter the topic you want to write about. For example - at BuzzSumo, we write often about content marketing and strategy. Here's an analysis of top producing companies on the topic of content marketing. Looking across these sites (and what a great selection it is! ), we see many thought leaders, blogs, publishers, and even some that offer complimentary products that assist with other content marketing efforts. But no one that is really a direct product or service competitor. Yet these are the leaders we want to benchmark against to create content that connects with an audience. Now that you've put together your competitor list, it's time to dig in to the results. You can learn a lot about a competitor's strategy by analyzing how often they publish new content. Back in Content Analysis, enter your competitor’s domain. 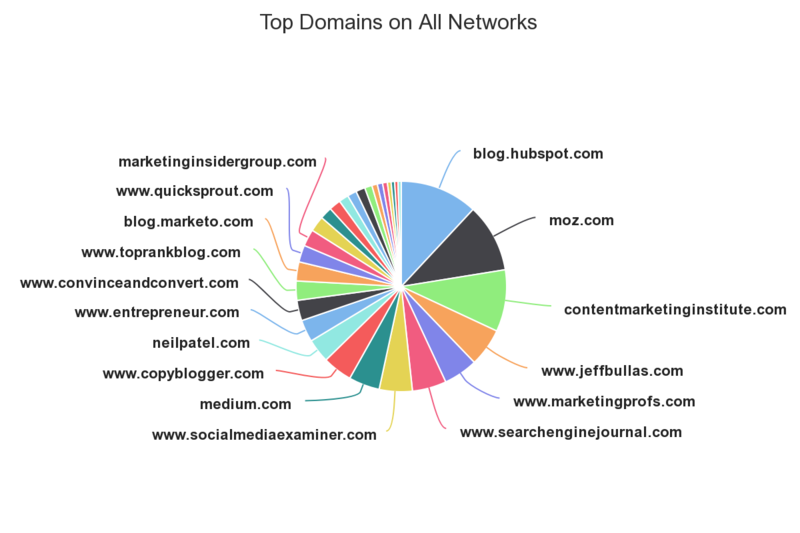 If you enter a top-level domain such as buzzsumo.com, you will get an analysis of all content published on the domain. This may include job posts and press releases. It may be more appropriate to analyze just a sub-domain or folder where a competitor publishes core content. For BuzzSumo, it would be buzzsumo.com/blog. 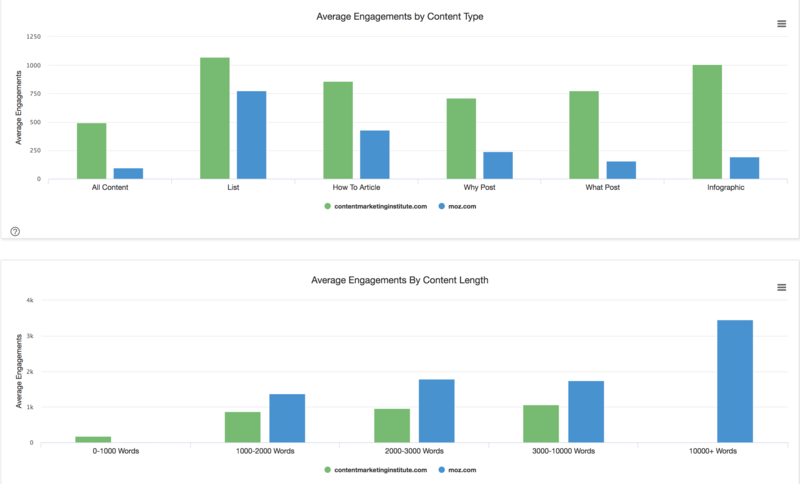 Below is an example analysis for Content Marketing Institute (CMI). We can see that CMI significantly ramped up their publishing frequency in 2017, posting almost 450 articles in the month of June. Yet despite this increase, the average shares of their content actually fell significantly. We can reasonably assume that CMI's decision to scale back its content in late 2017 is at least partially in response to these results. After the change, we clearly see a return to higher levels of engagement per article. Am I publishing too much/too little content? What would happen if I scaled up/down? What can I learn from CMI's strategy execution over the last two years? Next, you want to dig in to the social networks where your competitor's content is gaining traction. CMI's content over the past two years is predominantly shared on Twitter. And on average, their most successful content over this period has been 'list' posts, followed by 'how to' articles. Click the 'List' column and you'll see the exact pieces driving the most engagement. What is your top performing content type? What social network drives the most engagements for your posts? Is there an opportunity to diversify your content to take advantage of other networks and formats? 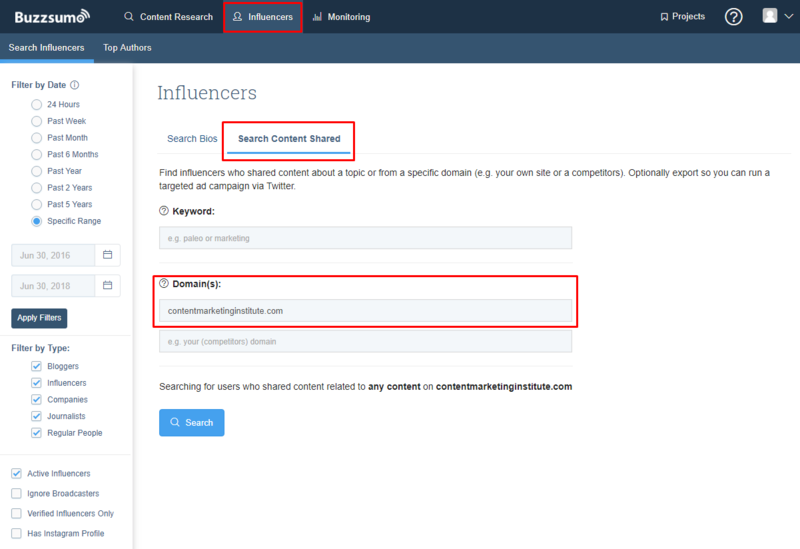 Go to the Most Shared section in BuzzSumo and enter your competitor's domain. This will display the individual pieces of content that have performed the best over a given period. For CMI, two of the top three pieces they've written have been about social media. We can also review specific content types. Since we already know 'list' and 'how to' posts work best, we can filter to either or both of those content types in the sidebar. Here's is a look at their 'how to' content. This may give us some ideas for 'how to' posts of our own. Try combining topics and domains for an even more targeted search. For example, LinkedIn and Medium are great sites not just to network, but to publish content. But the range of topics is much broader than you would want to pull into your research. Enter your topic and add a few domains to the Domain filter in the sidebar. Here's a search for articles on the topic of leadership development, published on linkedin.com or hbr.org. Are there opportunities to publish on third-party sites to complement your own blog? Backlinks offer a different, yet equally valuable view of high performing content. Run your search and sort by the 'number of links' column. Notice that the posts that drive the most links are not always the posts that drive the most engagements. For CMI, the articles that have driven the most links over the past 2 years have been a mix of the timely (trends) and the actionable (new research). If you add terms like trends or KPI to either your original topic or your competitors' sites, you can see if these articles are outliers or indications of a winning strategy for building linkable content. Both backlinks and social engagements amplify content. The more engagements and links, the wider the audience that may see your post. If your competitor’s content is gaining traction, it is useful to see who is helping to amplify it. We can do this in a number of ways using BuzzSumo. Start by reviewing everyone who has shared content on Twitter from a competitor's site. You can do this by navigating to the Influencers section, choosing "Search Content Shared," and entering their domain. Below are a few of the top influencers who have shared content from CMI. Use BuzzSumo's Backlinks feature to find the top backlinks your competitors are getting. You can also quickly view the top backlinks and sharers of any individual article. Run a Most Shared search for your topic or domain and click on either of the links next to the article title to pull up this information. If you haven't already, it's time to face the music and stand your content right next to your competitor's. Navigate back to Content Analysis, click on Domain Comparison, and enter your site and your competitor's site. Notice these charts display the same types of information as when you analyzed a site on its own. But seeing them side-by-side can really help solidify your gaps and opportunities. Don't panic if you're lagging behind. Remember, you started by identifying the top producers for your topics. Everyone has room to grow but not everyone takes the time to do a thorough, honest assessment of the current state of their content performance. You are already on your way to improving your results! Want to know more? Check out the free BuzzSumo Essentials course!